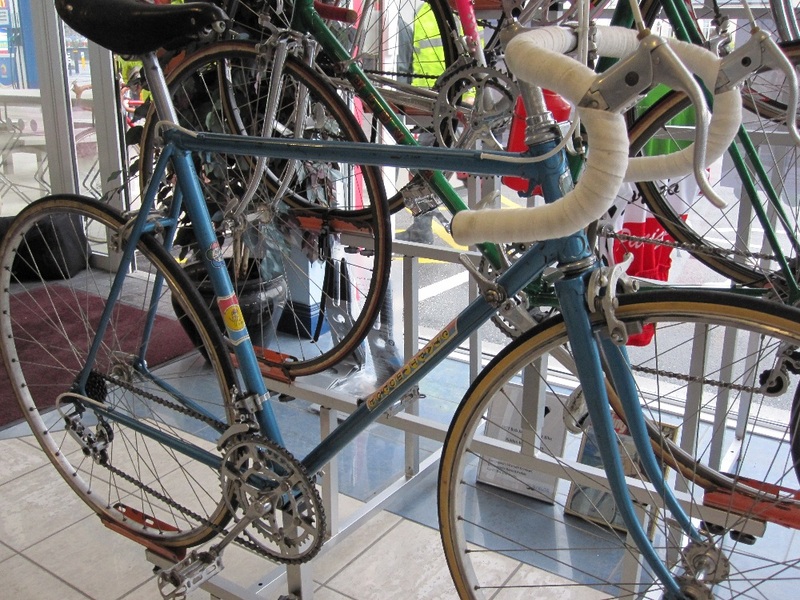 I am what you would call "mechanically sympathetic" which means I treat machines gently, including bikes and especially including the only old bike that I have put together myself. This means that when out cycling, I avoid potholes, try to pick the best route through broken or bumpy surfaces (even if this means slowing down a bit to identify the best line), lift myself off the saddle (to spread the load) if I realise I'm going to hit a hard spot on the road. All this for the bike's benefit, not just mine. However, in a sportive, you don't really get these options. 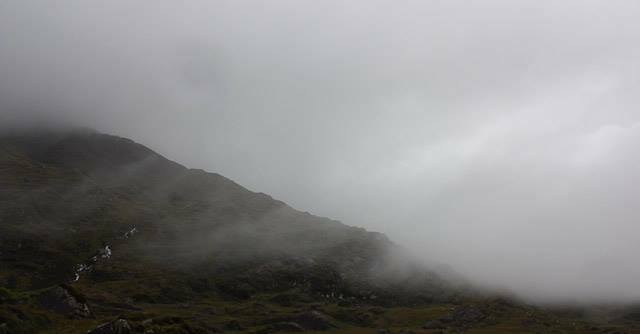 On very minor roads in Kerry you are going to find some very, very, dodgy surfaces, especially when there is a lot of rain about and you are not even going to be able to see the surface - it becomes pure survival. You can't slow down or you'll lose the group, or let the guy on front get a little further away. These competitive and survival instincts mean that the mechanical sympathies get pushed very far back down the priority list. 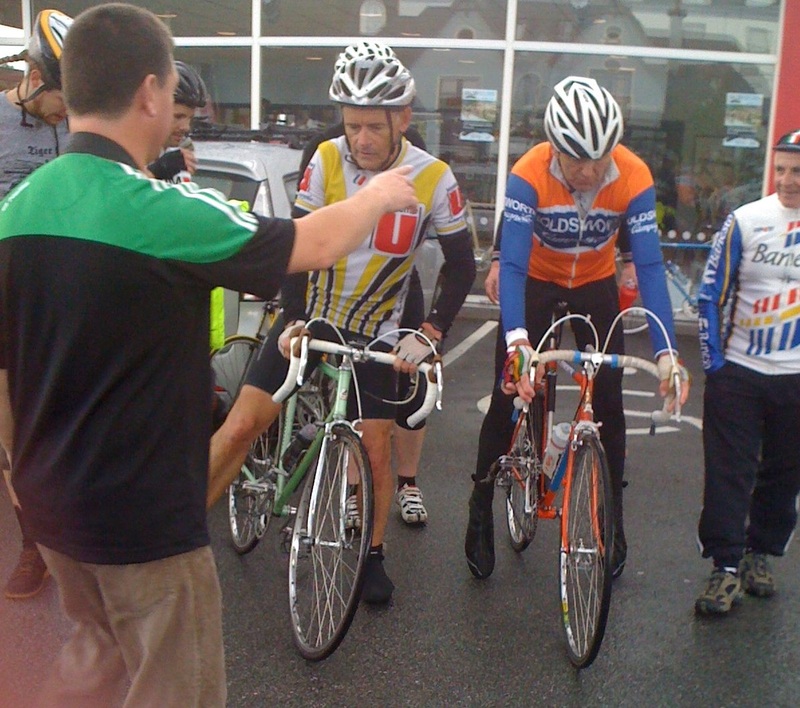 And this is what happened to me in the OldVelos Vintage International Classic. 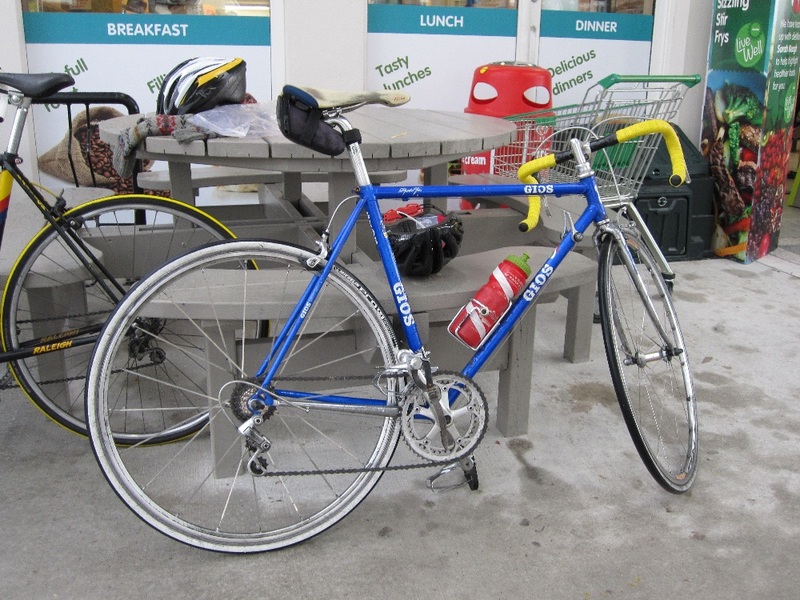 I treated the bike badly - and this is how it stood up to the test. Before you read this, you need to know that I am a hills junkie. If I didn't live so close to the Dublin/Wicklow mountains, I would have given up cycling long ago. So my review of the event is perhaps biased by the event profile - check my strava link below to see it. Sometime around July 2015, having injured my calf twice in rapid succession, I was unable to run, and for some reason wasn't doing my normal long cycles either, I felt I needed to have a target. 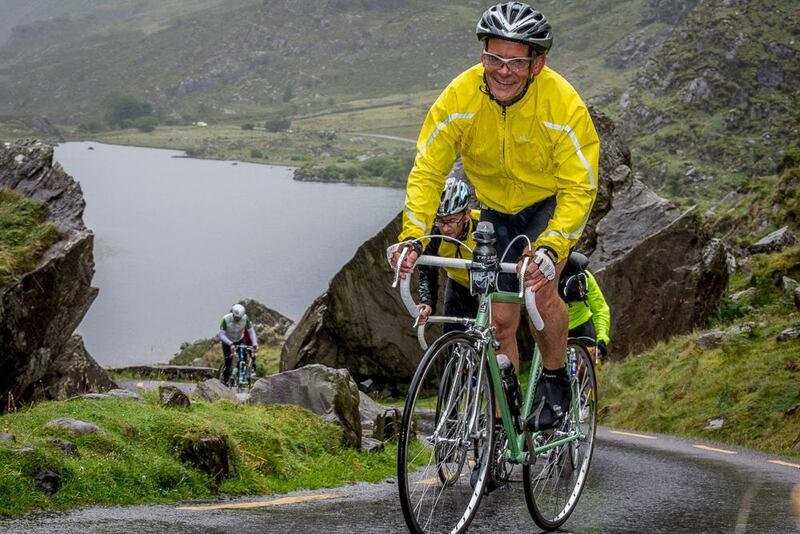 I looked through the Cycling Calendar, specifically for a late summer sportive in or around Killarney - I could combine a break in my favourite hotel with a cycling event and give me a reason to train. 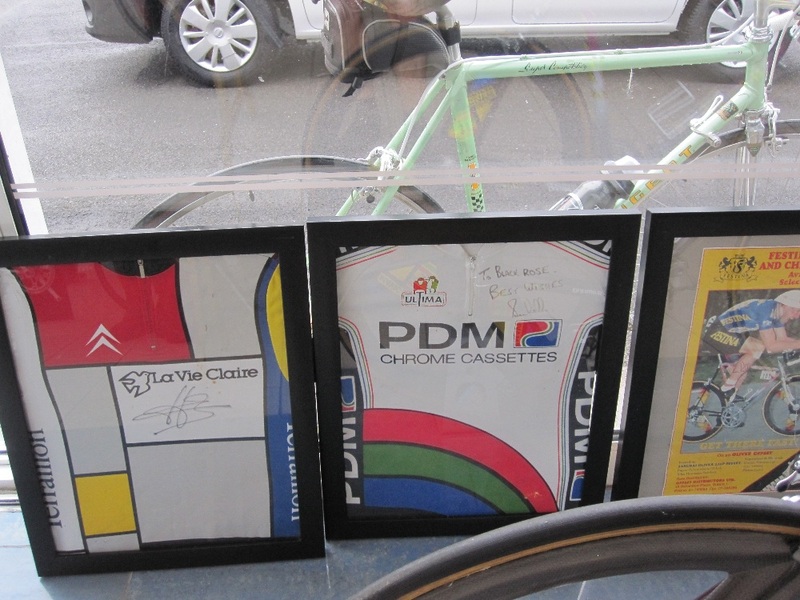 I spotted the Vintage Internal Classic (VIC), run by OldVelos on Sunday, September 13, and bingo. 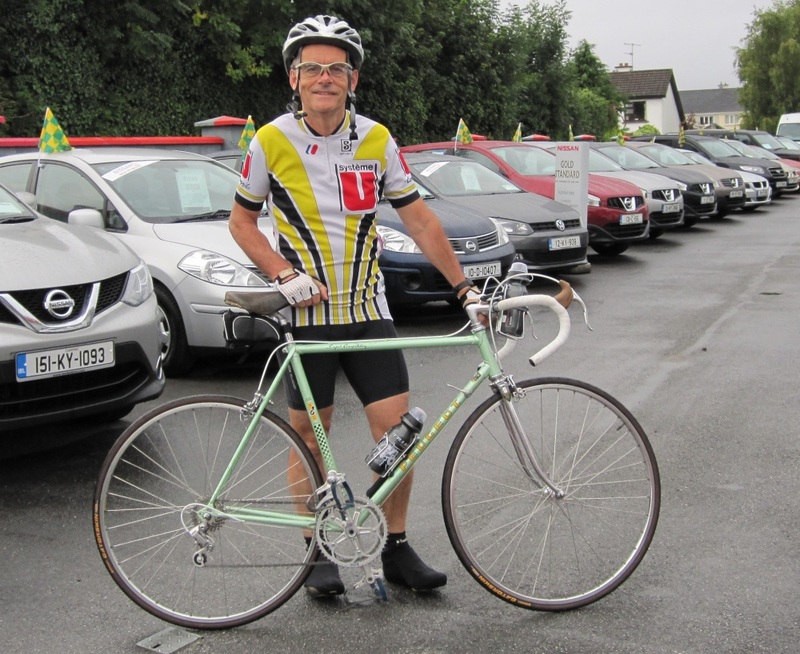 Not just a sportive but one for vintage bikes, perfect for my 1980 Peugeot CFX-10, and perfect for me with loads of tough hills. An excellent target to make me train harder. After a few silly questions to the organisers, which were not answered due to them being on holiday (I assume) I booked the hotel. Commitment. 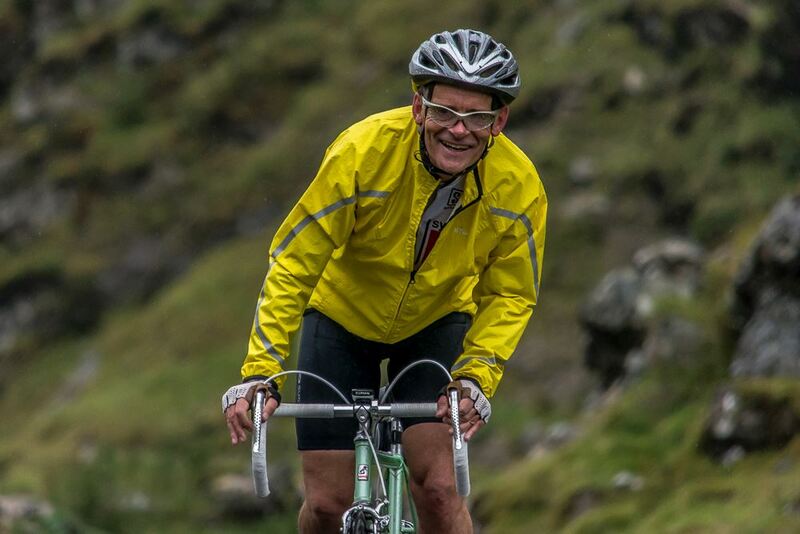 I had a vague idea that if the weather on the day was wet, I'd just skip the cycle and enjoy my stay in the hotel, after all, my Peugeot was for dry weather only - smile. Roll forward 6 weeks. Orange Weather Alerts (Rain and Flooding) for most of Ireland, but especially in the West of Ireland, and more particularly in the SouthWest - i.e. Kerry. Major rainfall in Kerry, many roads flooded. Arrived in Killarney to fine weather but rivers in flood and Killarney Lake water level pretty high. Fellow hotel guests informed us that they had never seen anything like the rain on Friday. Forecast for Sunday (VIC Day) was wet, wet, wet, and the Orange Alert was still in force. 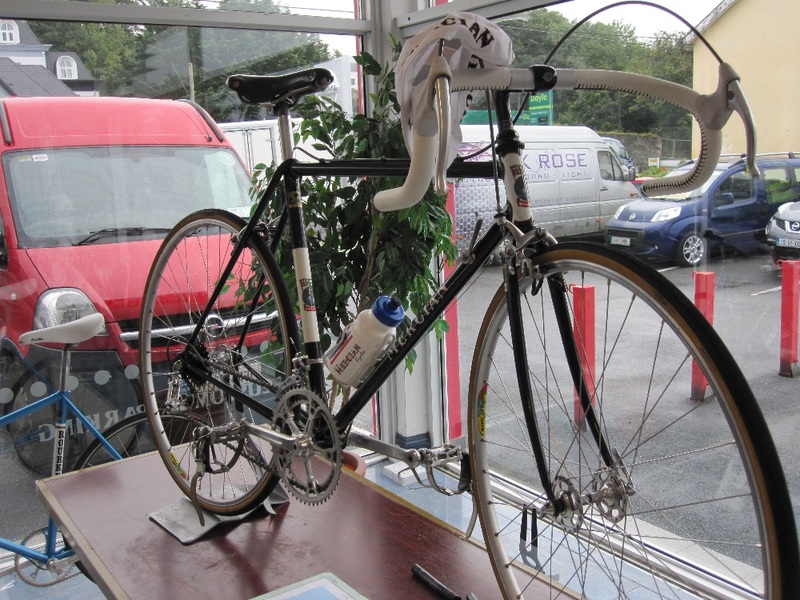 Called into the VeloExpo in Randles Nissan Garage and it was like walking into bikers heaven. 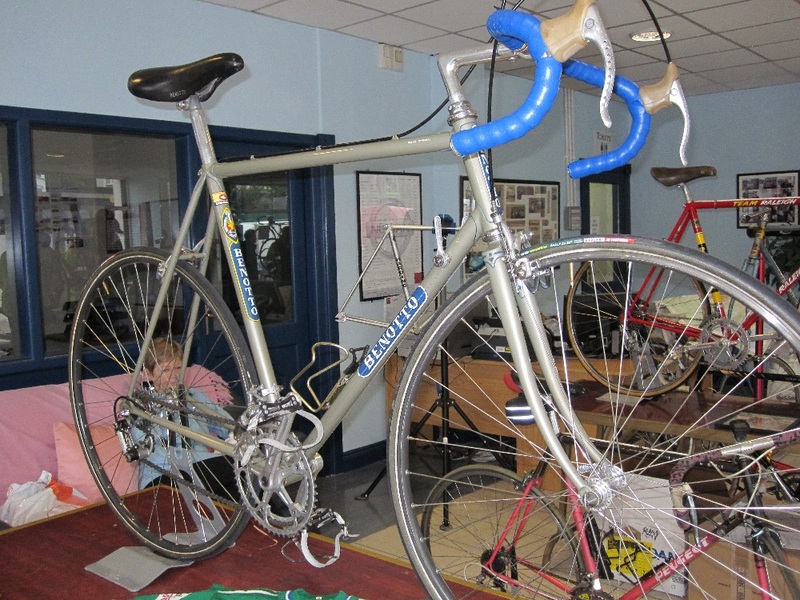 Loads of old bikes. 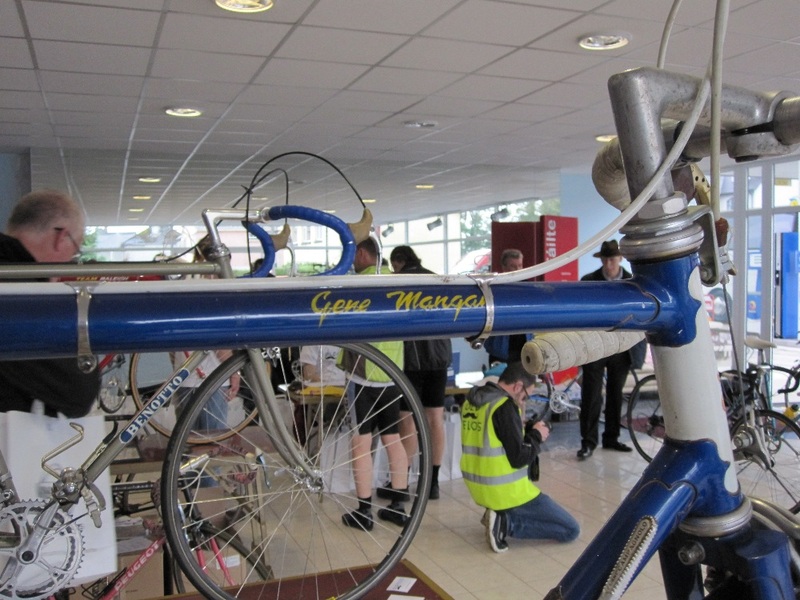 I was proud of the condition of my Peugeot, but many of these were pristine and quite a few of them were going to be used in the event. 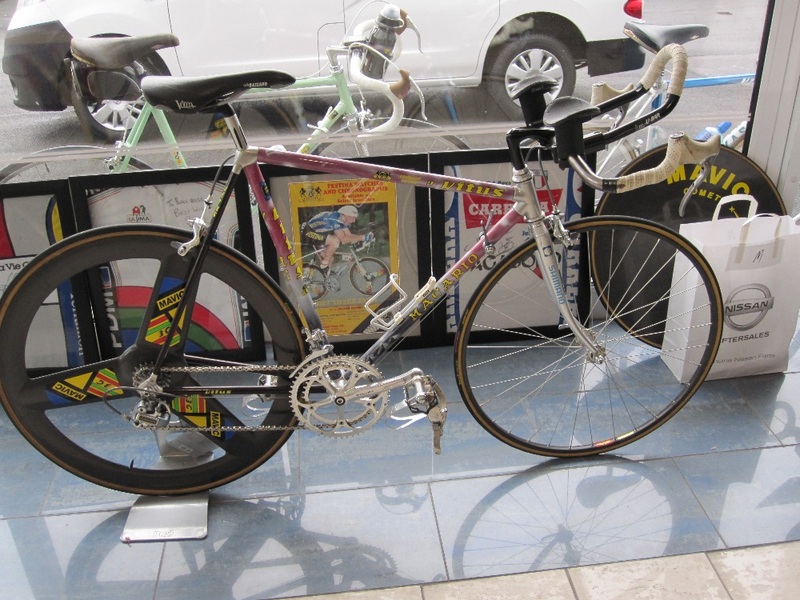 And everyone in the place was an enthusiast, for cycling and for old bikes. Chatted for awhile, checked out the bikes and headed to the hotel for an early meal. Raining. Not overly heavy, but pretty persistent. Breakfast in hotel, cycle to Randles, enter the event and chat to other entrants. 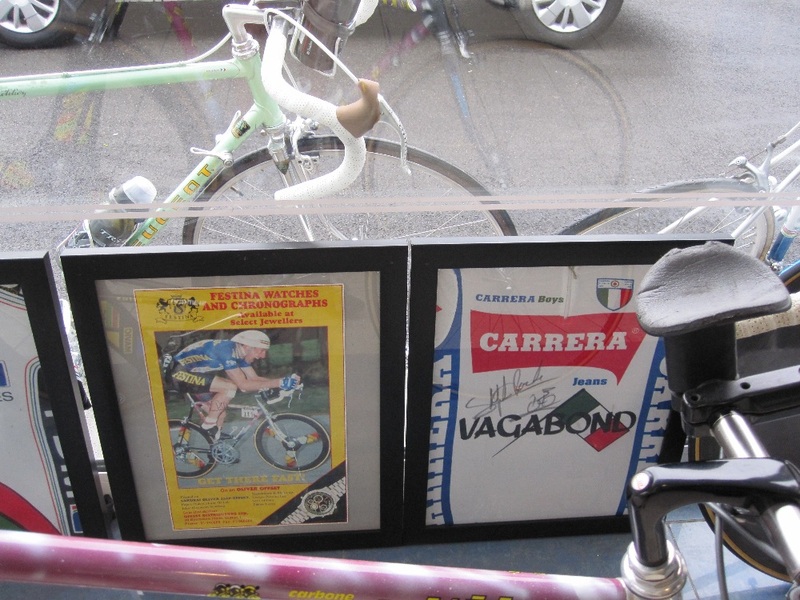 More bikes to admire. 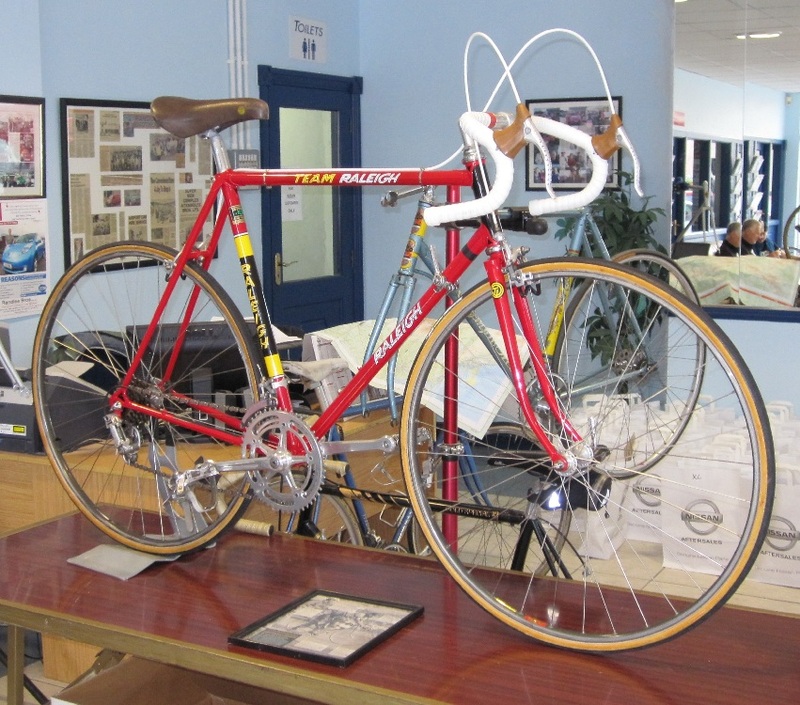 Wait for Concours d'Elegance presentation - a gorgeous Vitus 979 KAS bike. No argument with the judges there. Listen to the safety briefing which was excellent "wet descents, rutted roads, loose gravel (even more after friday's rain), bends on downhills which tighten and throw you off line" - but the advice was well timed and necessary. Head out in procession through Killarney, in the rain of course, and I'm near the back of the peleton chatting. 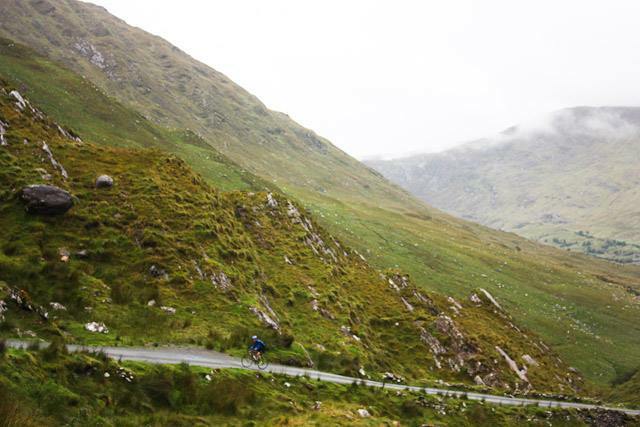 Twice before we get to the Gap of Dunloe, I find the peleton has split and I'm in the second group. Twice I have to chase and get onto the first group. Wasting energy already. I vow to stay near the front when we hit the Gap proper. I know these roads. Immediately after Kate Kearney's Cottage the road goes up. There is some chaos, people in wrong gears (and it's hard to correct that with downtube shifters when you are on a real steep bit) so a bit of "threading my way through" is called for. By the time the road flattens out a bit, I reckon I'm somewhere close to the top 10 and I have room to do my own thing. I can relax and enjoy the cycle. It's still raining of course. When we hit the steep bit of the Gap (where the 15% hill is) I settle into my rythm which is out of the saddle quite a lot and get up the hill steadily in my lowest (42x26) gear. I'm enjoying myself and pass a few. Another flatish stretch before we climb the couple of hairpins to the top and I'm swapping places with a Gios that I end up meeting quite a few times during the day. The descent of the Gap is "interesting". 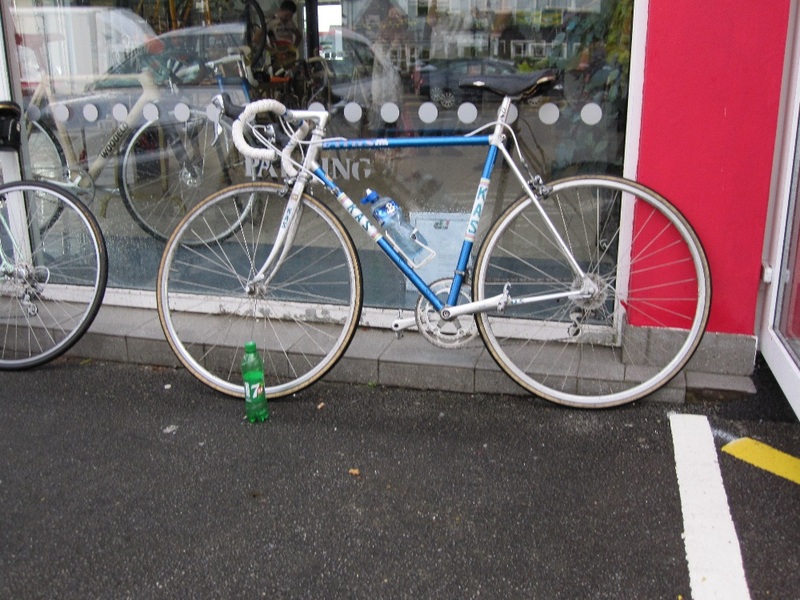 My Peugeot was one of my "fine weather bikes" and has never been used in the wet, it's brakes are "period correct" (i.e. for slowing, not stopping) and it was to be a new experience when wet. 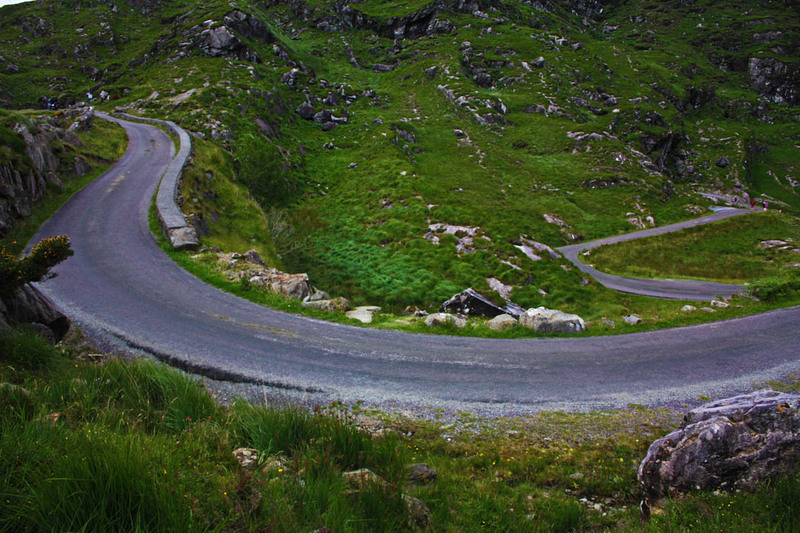 The testing ground was to be the rather steep downhill between the Gap and the Black Valley which "was badly rutted in the hairpins at the bottom". I got down safely, if a little slower than some of my companions, and now had a good understanding with my brakes. Pull hard to slow down, pull harder still to slow down more but start checking the ditches for somewhere soft to land. 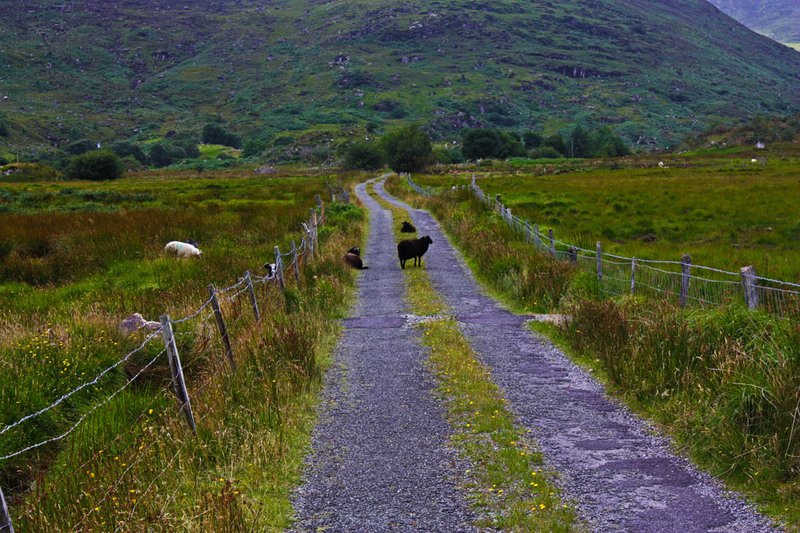 The road through the Black Valley is beautiful in fine weather, but rutted and broken in all weathers, It has been over painted with tar many times but that does not conceal the fact that it was originally placed on a bog. Cue an Irish equivelant to Belgian Pave - oh, and throw in a few short sharp humps and twists to keep things interesting. What surprised me was that I cycled fast over these bits in my Peugeot, on previous trips I pussyfooted over them in my modern Ti, and my Peugeot took it in it's stride. All except for the cheap chinese (3 euro including shipping) handlebar mounted bottle cage that I bought on EBay to give me capacity to carry a second bidon. The alloy bottle cage tore and ended up hanging off - must have been the constant bumpy surface at speed - also the fact that I mounted it a bad angle to provide space for my hands on the bars. I ripped it off and threw it and the bidon into the ditch, to an admiring comment from a companion "You did that like a pro". Vive Le Tour. 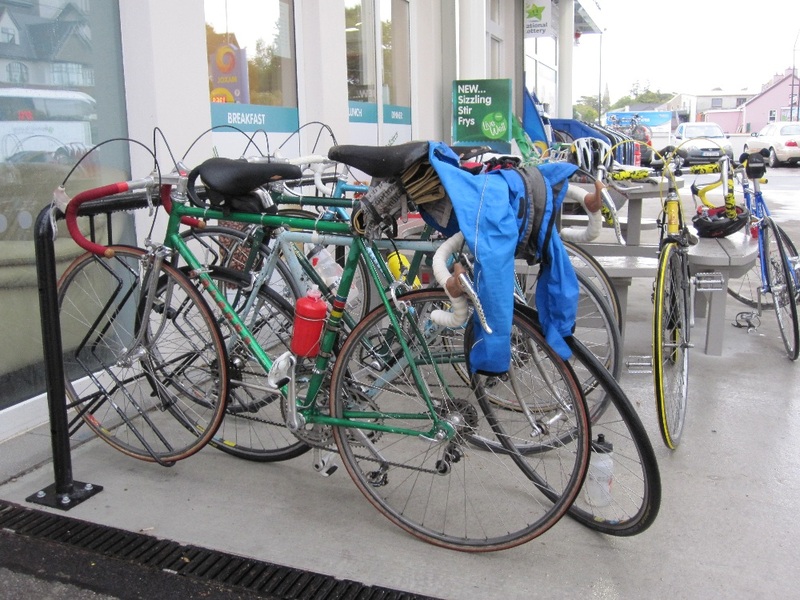 Stopped for a banana and water refill at the first stop and let most of my companions continue without me, I also, foolishly as it turned out, took my rain jacket off as the rain seemed to be stopping. This was a beautiful continuation of the road through the Black Valley, which for 6km had a central reservation of grass running between two strips of tarmac which varied from bumpy to broken. I actually thought it had been laid as two separate strips of tarmac, but I've since seen old photos of the road which would indicate that at some time in the past, both strips of tarmac did meet in the middle. 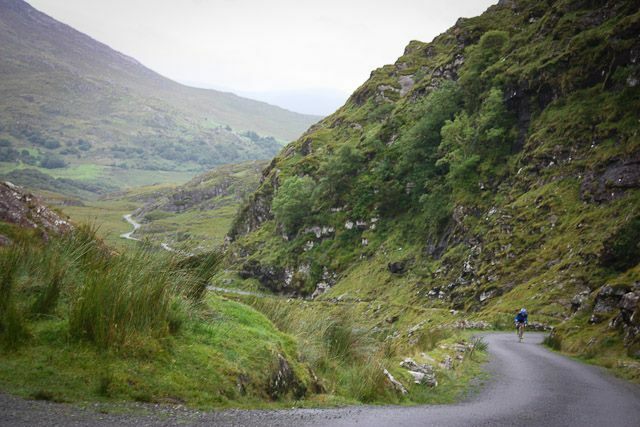 Advice from the marshal at the water stop was to use the right hand strip when descending beside Lough Brin as the left hand bushes were very over grown - evidence of how little motor traffic the road saw. 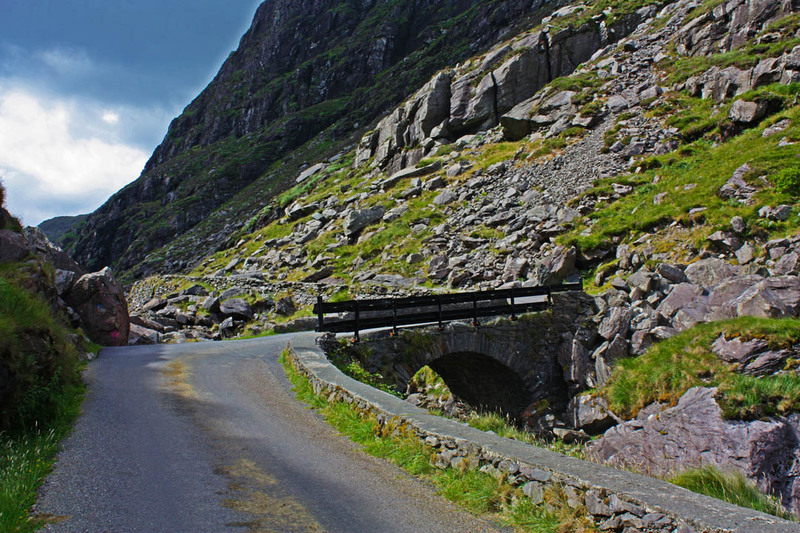 It was a terrific road to cycle, great climb in the middle, fast descent, no cars and apart from realising that I should not have taken off my rain jacket, and stopping to put it back on, I really belted it. Seems I beat the old best time on Strava, which had stood since 2013, over the 6km segment only to find that two others on the day had cycled faster and uploaded before me, so I have a "3rd Place Overall" in my Strava Palmares, and since then a few others in the event have also uploaded, so I'm now 6th in the overall standing. Oh, for not having taken off my rain jacket. Caught and joined another cyclist for the transition to Ballaghbeama. The climb to Ballaghbeama worried me, as did the descent. But it needn't have. Long, no wind, wet, but quite gradual. The sort of climb you can cycle on, until that is, you reach the last stage of it. 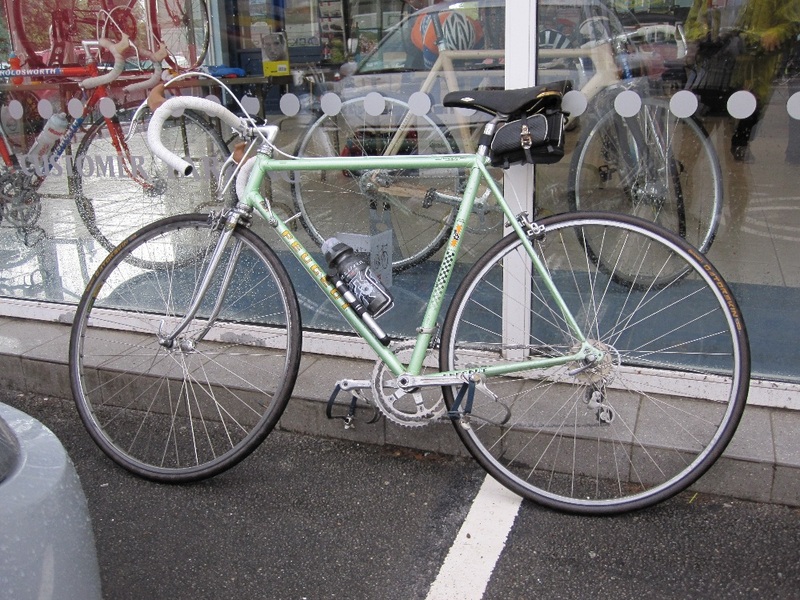 Then it's out of the saddle, lowest gear and slog. Could see a group of about 6 ahead which climbed together until that final stage when they really broke up, and it was interesting to observe from further down. We managed to close them down a bit before the final stage and then mix it a bit when they broke up. Everyone waited up at the top until all regrouped including another two who were behind us. Then a fast descent, steep and some slight bends where you could largely see the road past the bends, and this allowed the group to descend "Tour de France" style, i.e. sweeping from kerb to kerb (ditch to ditch) to straighten the line which is both exhilarating and rare - I was 6th in line so I felt it was safe to do this as there were five experienced (or idiotic) cyclists ahead of me and I could see most of the road ahead anyway. This was all grand until one "Oh Sh#t" moment in one of those forewarned "tightening" bends and I eased off but so too did the others. Without knowing the roads, but knowing the geography in general, I foolishly announced that it's "downhill to the feedstop". It wasn't, there were a few drags, and on each one, I was reminded of my previous announcement - I'll keep my mouth shut in future. Decision point for long (75 mile) or short (60 mile) route. Warm fire, loads of grub, comfy chairs, and dry. Could stay forever. 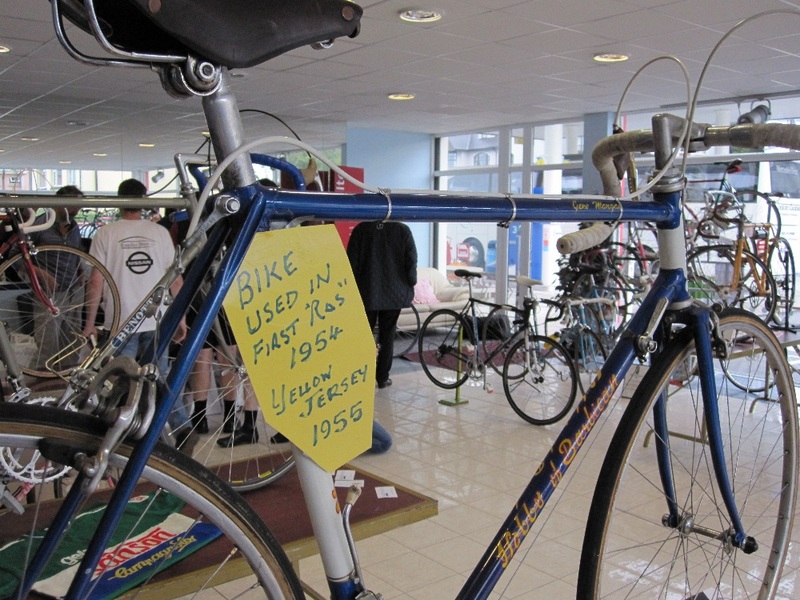 A chance to look over some of the bikes and talk to the owners. 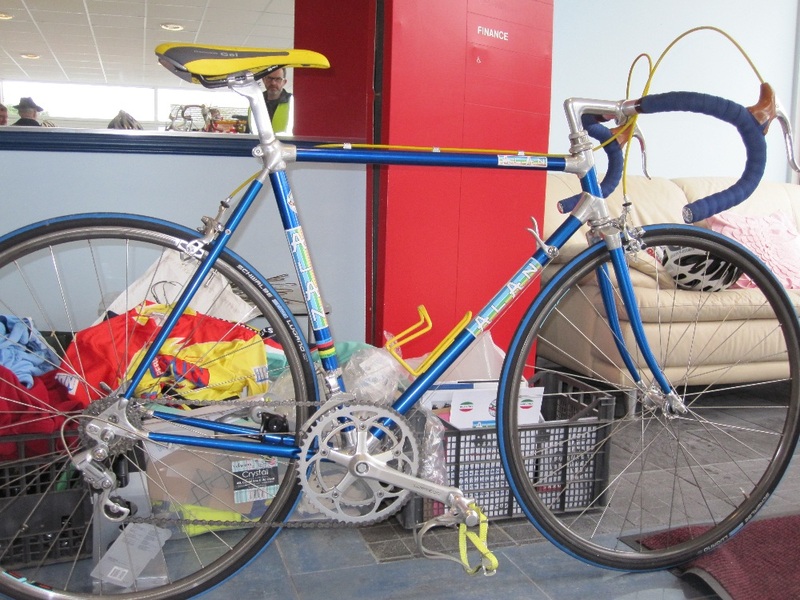 I found out that not all Alan bikes creaked in the bottom bracket area, mine does, so I'm glad I made the decision not to use it on hills a few years ago. Had been canvassed by Brendan Hennessey when we arrived as to who is doing the long route. As I was really enjoying myself by this stage, legs were still good, I had managed the toughest climb comfortably enough, the bike was holding up very well (in particular my threadless bottom bracket was showing no signs of self dissassembley), and I was totally soaked and as such could get no wetter, so without really thinking about it I stated that I was doing the long one. I assumed most were. As it turned out, only about eight or ten of us were. When the long group were assembling, I went back into the pub to give "a last chance to do the long one" to the assembled cyclists and they laughed at me - they thought we were nuts (probably right too). I knew the first part of this, the easier west side but had no experience of the other tougher side. Just after we started the loop, the heavens opened and we were in torrential rain for a while (a message from above that we were completely nuts perhaps? ), I'm sure the crowd in the pub were now laughing even louder. The pity about the heavy rain was it totally obscured the lake views that I knew were spectacular on a fine day. The group by and large stuck together and got a chaingang going for a while. Fairly quickly we got around the bottom of the lake and were approaching the tough side when "bang". Not me, but one of our group had a tubular blowout. No spare but another rider had one, but then it was noticed that there was no glue on the rim so another tubular would not sit on. As luck would have it, given that it felt to me like we were in the middle of nowhere, one other member of the group lived "only a mile away" (only in Ireland?). The two of them got a lift in the following van to pickup a spare front wheel and continue the cycle. We left them there and continued. If I thought that Ballaghbeama was the toughie for the day, I was in for a surprise. 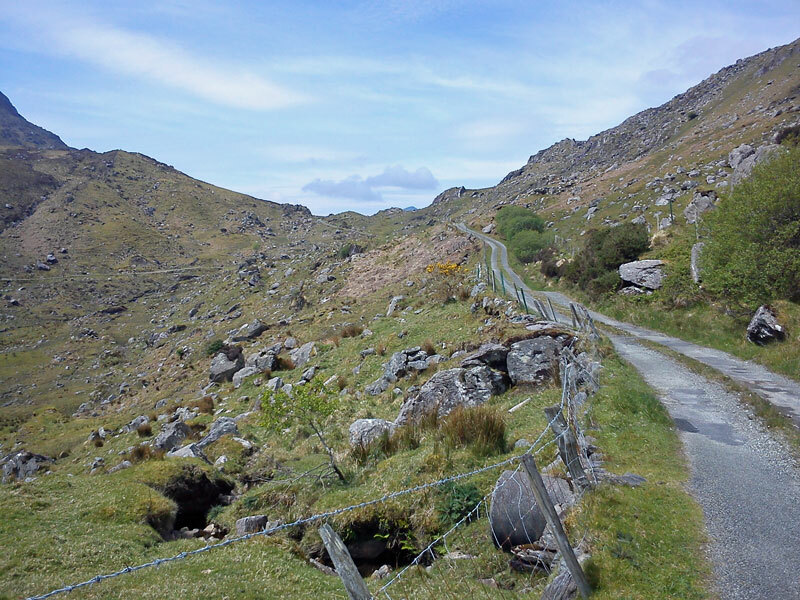 The Devil's Elbow and the rest of the climb felt tougher - although not apparently on paper. maybe it was the distance that was making it seem so. At the top we were warned about a very sharp switchback and a big rut in the road and the motorbike marshal went on ahead to try and flag them for us. He did a good job, and the warning meant that I was taking more care than I would have normally done. Both obstacles safely negotiated and an even closer understanding with my "period correct" brakes in the wet. More road with a grass central reservation and like the previous not to bad for belting along. Then a very sharp downhill (brakes full on and only slowing down, not stopping) to the Rowan Tree again. A regrouping and an opportunity to finish off any leftover sandwiches and brack. Didn't go inside though, as we were not stopping for long. Things got a bit confused here. We had to climb up to Lake Acoose and then a home run, largely downhill (my interpretation although I did not speak it), but probably into a slight wind - about 20 miles in all. There was a bit of talk about sticking together as a group, some people were tired and some were off message. So there was a bit of a break. After the third person went off the front, I decided to follow, and pretty soon was chasing the only man in front, then overtaken to be number three in line. 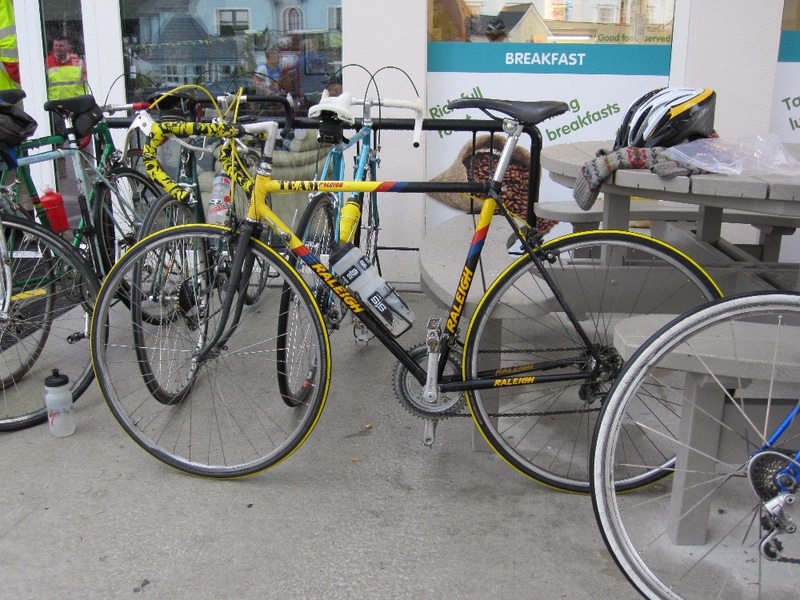 However, the man with the punctured tubular, now replaced front wheel, when in the lead had another blowout - back wheel this time and after everyone stopping and discussing, again no glue, he decided to abandon and take a lift home. So we set off again. Still some off message, so I ended up chasing the front man and cycling at my own pace, being able to see the lead car on the short straights - I found it easier that way as the group pace was fluctuating a bit especially on drags. Caught the lead car (stopped) a few kms from Killarney and they were hoping to have the group form a peleton for the run into Killarney. So waited up and reformed. It was a nice way to finish. A lot of congrats between the group members and a recognition of a good job done. 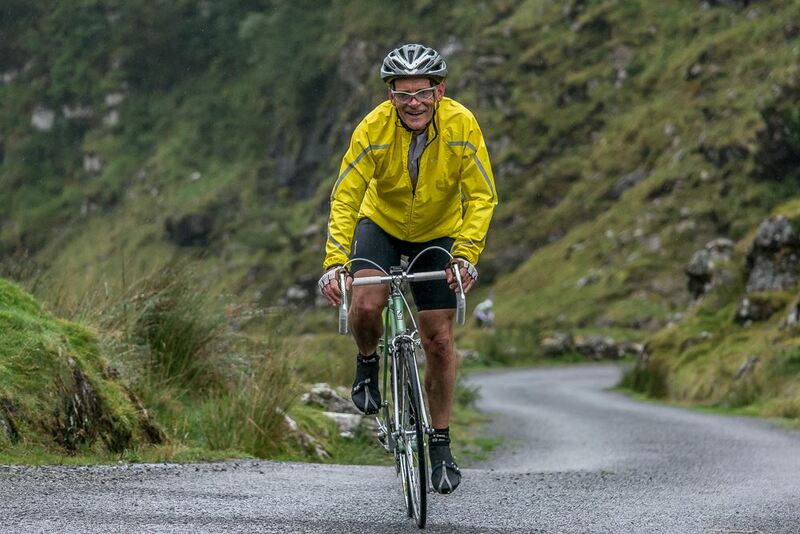 I think we all deserved the title "Hard Men", why even Sean Kelly would be proud if he'd been there. And all with beaming smiles on their faces. How did the bike survive? Apart from the aforementioned, cheap, bottle cage, everything worked as it should. The brakes were just ok in the wet, as they probably were when new. The threadless bottom bracket, that now relied on strips of a teeshirt for packing (see my section "The Velo Orange Threadless BB" for details), stayed resolutely in it's place (that had been my biggest worry with the pressure of all the hill climbing). The only item I noted in the whole cycle was my rear brake lever developed a rattle which I thought indicated that it was getting a bit loose on the bars (maybe the clamp was loosening) but when inspected later it looks like the brake caliper is not returning fully after being used, leaving some cable slack and thus the lever is rattling a bit. Maybe the cable stretched or slipped through the clamp bolt a little - not surprising given how much force I was applying when trying to stop/slow down in the wet. Nice to think that was the only flaw in my vintage build project. When I finished, and before I showered - yes, really, I wiped the bike clean and mostly dry with some old towels I brought for the purpose, then I sprayed oil onto the chain, cassette, and derailleur pulleys. After that, I put the bike into the hotel's bike storage for a few days. That 10 minutes effort had the advantage of allowing me to store the bike at home and clean it at my convenience - time well spent. Weather : The next day, the water level in the lake outside my hotel was over one foot higher than it had been the day before the event. What that says about the amount of rain that fell in the Killarney area on Sunday is significant. Hard men we were. Organisers : The organisation and the volunteers who put this event on were brilliant. The professionalism, enthusiasm, local knowledge, safety instructions, all were spot on. It was a truly enjoyable day, even the terrible weather could not dampen my spirits and all photos of me taken during the day have me with a big smile on my face. Thank you to everyone. Companions : I entered the event not knowing anyone else. That didn't matter, indeed it never does in cycling, but I got to know some bikes and cyclists. As one cyclist said to me when we met afterwards "it's not about the cyclists, it's about the bikes" when I asked him "were you the guy with the Motobocane and the 48 small chainring". We were identified by our bikes. And to all the other bikes and cyclists "well done and thanks for the company" - even those with clipless pedals or aero brakes (He! He!). The Lake Hotel Killarney I did mention that I stayed in my favourite hotel - this is it.